NHL 2K11 was released on August 24, 2010 as a Wii console exclusive, with a MSRP of $49.99. NHL 2K11 was developed by Visual Concepts and published by 2K Sports. The game features online multi-player with Wii Speak support, as well as Wii MotionPlus support. The ESRB rating for NHL 2K11 is E10+, or Everyone 10+, with "Mild Violence" being the only content listed for parents to be aware of. The "Mild Violence" refers mainly to fights that players may occasionally get into during the hockey matches. How many hours have Wii owners spent on the ice in NHL 2K11, since it released? Let's take a look! 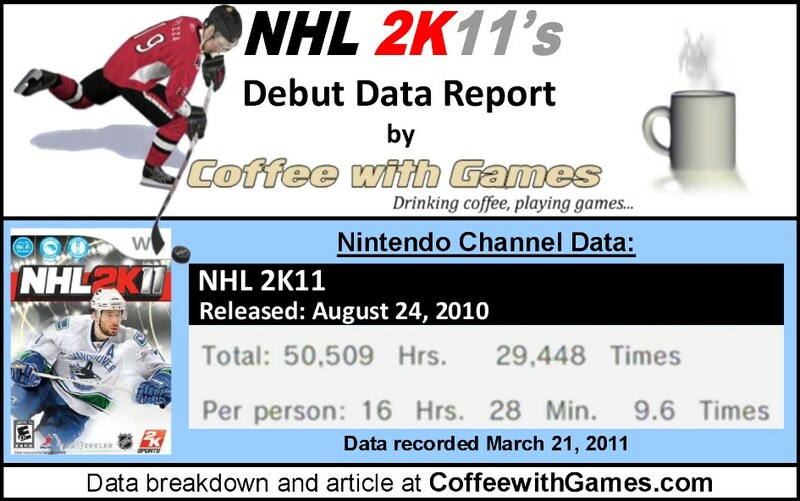 NHL 2K11 has 3,067 Wii owners reporting their data through the Wii's Nintendo Channel on its debut, with 210 days reported. 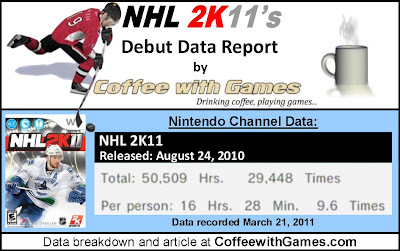 NHL 2K11 has 50,509 Total Hours of game-play reported on its debut, with an average play-time of 16 Hours 28 Minutes "Per person" reporting data. NHL 2K11's average play-time per session is just over 1 Hour 42 Minutes. NHL 2K11's Amazon.com sale rank is #1,040, and it is currently selling for $26.27. NHL 2K11's "professional" review score average is 62.73%, based on 11 reviews on GameRankings.com. NHL 2K11 has a 3.5 out of 5 Stars rating on Amazon.com, based on 11 customer reviews. NHL 2K11's customer review score average is 69.09%, when converted to a 100% review scale. You can see the customers' review scores in the image below. The cover athlete for NHL 2K11 is Ryan Kesler, who plays for the Vancouver Canucks. He first joined the Canucks in the 2003-2004 NHL season, and still plays for the team. He was involved with the NHL 2K series before 2K11 released, when he participated in a motion capture session for 2K10. While I haven't played NHL 2K11, I remember reading about NHL 2K11 last year, and I was impressed that the developers included Wii MotionPlus support, as well as online multi-player with Wii Speak support. 2K Sports announced last year that NHL 2K11 was going to be a Wii console exclusive, while they took a break from developing the game on the PS3 and Xbox 360 consoles, so they could think and come up with ways to redesign the game on those consoles. While I was researching information for this post, NHL 2K11's Wikipedia page said this, "Due to poor sales of 2K11 compared to EA Sports NHL Slapshot, this will be the last hockey game made by 2K Sports." There wasn't a source for that information, it was just provided under the "Reception" section for the game. I don't know if NHL 2K11 is the last hockey game specifically for the Wii for 2K Sports, or for all consoles including the PS3 and Xbox 360; I'm going to see if I can get some clarification, and update this post if I do. Have any of you played NHL 2K11, and if so, what do you think about the game...good and/or bad? Is it a sports series that you hope 2K Sports perhaps brings back in the future? I didn't know what Selke was...until a quick Google search and Wikipedia page informed me. Because of your comment, I learned something new! Do you think Kesler has a good chance of winning it? I'll have to see if this game is one of the cheaper "favorite rentals" at a local rental place. I was always interested in trying out the motion control heavy sports games for Wii, but simply because of their subject matter, I know they would never hold my interest long enough to make it worth even a $15 price tag. I played the NHL Hitz series, and I think one of the 2K games, a lot last generation. This generation though, haven't purchased/played one hockey game on a current gen system that I can remember. As for motion controlled sports games, I'm interested in this one because of the WM+ support.